Fran Kranz, Emma Fitzpatrick Face Bloodsuckin.. 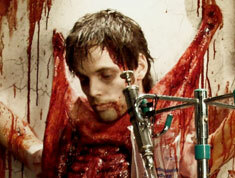 Exclusive: Want to See Some Gory FX Too Extre.. Shock Interview: Marcus Dunstan, Patrick Melt.. 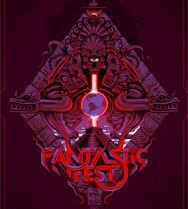 This review was originally posted in September during our Fantastic Fest coverage. We’re re-posting in time for the film’s release this Friday. When we last saw Josh Stewart’s Arkin in 2009’s The Collector, he was in a bit of a tight spot. Things were not looking good for the thief who, while on a job, met a lethal, black mask-clad, seemingly unstoppable home invader. I’ll refrain from repeating what went down at the end of The Collector, in the event you never saw it (and if you didn’t, maybe you should avoid this review). Nevertheless, I thought the first film was solid, entertaining, fairly ruthless and it boasted the visual strengths of Marcus Dunstan as a director who had, until that point, made his mark on the genre co-writing some Saw sequels and the Feast films. With The Collection, Dunstan (and creative partner, co-writer and producer Patrick Melton) is back behind the camera with more confidence for a sequel that takes things to all-new extremes. If you really liked The Collector, chances are, you’re going to really like this next sick entry quite a bit. It’s a little less intimate than its predecessor; however, it’s bigger than and just as wicked as the first. November 30th is being dubbed the “real” Black Friday as that is when The Collection, a sequel to The Collector, hits theaters. Today, we have a rather festive TV spot for the film to share with you, head inside and check it out! Directed by Marcus Dunstan, who scripted the film with Patrick Melton, The Collection is one of the “good” sequels to come along (read our review). Josh Stewart returns as Arkin who escapes with his life from the vicious grips of “The Collector” during an entrapment party. There, thbeautiful Elena is added to his “Collection.” Instead of recovering from the trauma, Arkin is suddenly abducted from the hospital by mercenaries hired by Elena’s wealthy father. Arkin is blackmailed to team up with the mercenaries and track down The Collector’s booby trapped hide out and save Elena from his sadistic rituals. A new featurette for The Collection – entitled “the gore factor” – has floated our way and you can watch it via the player inside. 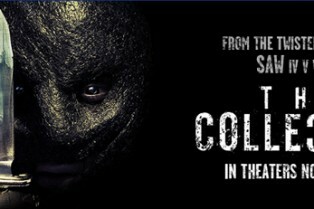 The film, directed by Marcus Dunstan (The Collector), opens on November 30th. Josh Stewart returns to the madness as Arkin; he’s joined by newcomer Emma Fitzpatrick. If you haven’t read our review, get into it right here. That black-masked maniac from The Collector returns this fall in LD Entertainment’s The Collection, opening on November 30th, and we have a TV spot to share with you. The sequel, once again, sees the return of Marcus Dunstan, on directing duties, and Patrick Melton (co-writing/producting) as well as Josh Stewart, star of the first film. We’re big fans of this sequel; you can read our review right here. If you happen to be in the Los Angeles area, The Collection is going to have a panel at the Long Beach Comic-Con. Head inside for the TV spot! Back in August, we brought you a look at the international poster for The Collection, the sequel to The Collector, which will be making its way to theaters on November 30th. Today, we’ve got a look at the domestic version which places “The Collector” himself dead center. Check out a bigger version after the break. Marcus Dunstan is returning to direct, working from a script he penned with Patrick Melton. In the film, Arkin (Josh Stewart) escapes with his life from the vicious grips of The Collector during an entrapment party where he adds beautiful Elena to his “Collection.” Instead of recovering from the trauma, Arkin is suddenly abducted from the hospital by mercenaries hired by Elena’s wealthy father. Arkin is blackmailed to team up with the mercenaries and track down The Collector’s booby trapped hide out and save Elena from his sadistic rituals. Screamfest kicks off its 12th annual festival on Friday, October 12th at 8:00 p.m. with the opening night horror The Collection, directed by Marcus Dunstan. Screamfest runs October 12th through October 21st at LA Live Regal Cinemas (1000 West Olympic Blvd., LA, CA). You can read our review of The Collection via this link. Marcus Dunstan and Patrick Melton hit the red carpet premiere of The Collection at Fantastic Fest in Austin, Texas (look for our review shortly) and the team – who previously gave us The Collector and many Saw sequels – spoke to us a bit about how the sequel raises the stakes and offers a bit of insight as to who “the collector” is. “The first one was a mean pinpoint on: What if cruelty got into your house? This is: What if you found out where that f**ker lived?” explained Dunstan, who directs and co-wrote the film with Melton. The trailer for the upcoming horror thriller The Collection is now online and you can check it out in the player below the synopsis, with a newly-debuted banner underneath. When Elena’s (Emma Fitzpatrick) friends take her to a secret party at an undisclosed location, she never imagined she would become the latest victim of The Collector, a psychopathic killer. The Collector kidnaps and transports her to an abandoned hotel he’s transformed into his own private maze of torture and death. Upon learning of his daughter’s disappearance, Elena’s wealthy father (Christopher McDonald) hires a group of mercenaries to retrieve her from the vicious grips of The Collector. 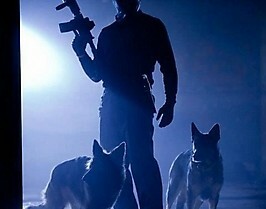 These mercenaries coerce Arkin (Josh Stewart), the only man to have escaped the wrath of this heinous monster, to lead them through the gruesome labyrinth. Now, Arkin finds himself fighting for his own life in order to save Elena. Is This New Poster Art for The Collector Sequel The Collection? The official site for The Collection, a sequel to The Collector, has revealed a placeholder image which, I suspect, is showcasing the artwork for the U.S. poster. Often, a distributor will use poster art as placeholders when sites have not officially launched. The international poster premiered last week, so we were bound to see the domestic art soon enough. The Collection was written by Patrick Melton and Marcus Dunstan and was directed by the latter. Head inside for a full look at the art. If you missed out on our 2012 Fall Horror Movie Guide, then you might have missed out on the news that The Collection, the sequel to The Collector, is making its way into theaters on November 30th. The official Facebook page for the film has dropped on its followers a look at the official international poster. Marcus Dunstan is back to direct, working from a script he penned with Patrick Melton. In the film, Arkin (Josh Stewart) escapes with his life from the vicious grips of “The Collector” during an entrapment party where he adds beautiful Elena to his “Collection.” Instead of recovering from the trauma, Arkin is suddenly abducted from the hospital by mercenaries hired by Elena’s wealthy father. Arkin is blackmailed to team up with the mercenaries and track down The Collector’s booby trapped hide out and save Elena from his sadistic rituals. Head inside for a larger look at the poster! Fans of The Collector have been wondering: Where is the sequel, The Collection? Well, it’s on the way. The thriller – once again from writers Patrick Melton and Marcus Dunstan (the latter back on directing duties) – is screening at Cannes and we’ve stumbled on the first official photo from the film. It’s a small one, however. Head inside for a somewhat larger look. Liddell Entertainment announced today that Marcus Dunstan’s follow-up to 2009’s The Collector will get distribution via their new company, LD Distribution.